This mekabu seaweed has been julienned and then heated, bringing out its viscosity. Once defrosted, can be served with ponzu soy sauce or other seasonings, or used in miso soup and salads. 300g total (3 bags, 100g each). 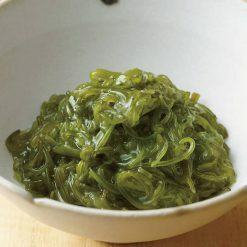 This mekabu seaweed is high in nutritional value (mekabu is the root portion of wakame seaweed) and has been finely sliced. It comes in small, easy to use bags. Our manufacturing method utilizes Joule heating. We run electricity directly through the mekabu seaweed, and electrical resistance causes the mekabu to heat up. This method of heating causes less inconsistency than boiling. It also conserves flavor, since the only water being used is the water in the mekabu itself. If you did not grow up eating seaweed, it may at first look and feel quite strange! However, seaweed is a quick and delicious way to add flavor to rice and other foods, and is extremely healthy to eat. The mekabu seaweed in this product is produced in South Korea (Wando County in South Jeolla Province), and then brought to Japan to be julienned and heated. The width of the strips is around 2mm to 3mm but varies somewhat. 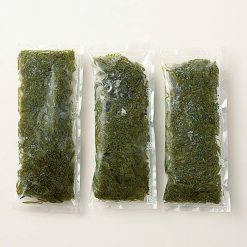 How to defrost: Defrost the seaweed in its bag in the refrigerator. To defrost more quickly, place the bags beneath running water.How to eat: Transfer the mekabu seaweed to a bowl, and serve with ponzu soy sauce (such as Sugarlady’s All-Purpose Kakepon) or your seasoning of choice. The seaweed can also be used as an ingredient in soups (including miso soup) and salads, or mixed with rice or pasta as part of a sauce or seasoning blend. This product contains mekabu seaweed (South Korea).. Origin of ingredients: mekabu wakame seaweed (South Korea). Prepared and packaged in Japan.